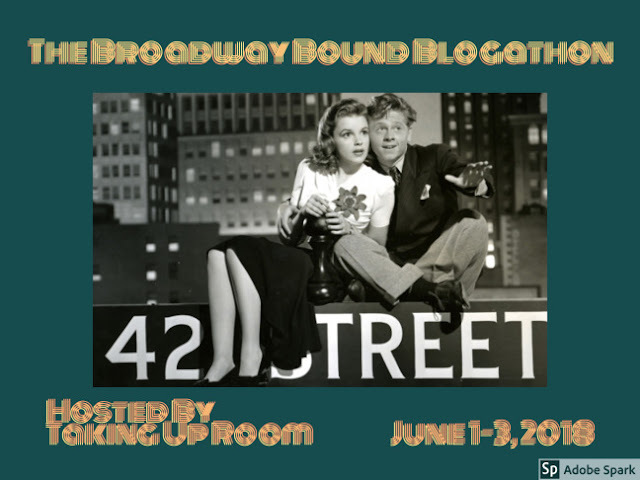 This article is part of The Broadway Bound Blogathon hosted by Taking Up Room. The Broadway musicals of composer Richard Rodgers and lyricist Oscar Hammerstein II were turned into several wonderful old Hollywood films. 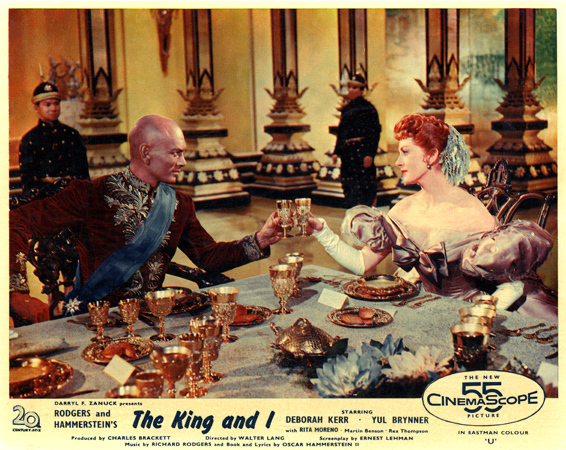 My personal favorite is the 1956 version of The King and I, which tells the story of the clash of wills between a proper Englishwoman (Deborah Kerr) and a despotic Eastern potentate (Yul Brynner). The King and I begins when Anna Leonowens (Kerr) and her son (Rex Thompson) arrive in Bangkok, where she has accepted a job as a teacher for the many children of the King of Siam (Brynner). Although Anna is delighted by her pupils and soon becomes fast friends with the king's head wife, Lady Thiang (Terry Saunders), and a Burmese servant, Tuptim (Rita Moreno), "Mrs. Anna" and the king soon clash over everything from housing arrangements (Anna repeatedly tries to make the king honor his promise to build her a house outside the palace walls) to The Bible (the king takes exception to the writings of Moses). The King and I is based on the historical fiction novel Anna and the King of Siam by Margaret Landon, which is about the experiences of the real Mrs. Leonowens who served as a teacher and language secretary to King Mongkut of Thailand (called Siam at the time) from 1862 to 1867. The novel had already been turned into a successful 1946 film starring Rex Harrison and Irene Dunne, but 20th Century Fox was eager to make a musical version of their prize property with Rodgers and Hammerstein, whose new musical South Pacific was then raking in money at the Broadway box office. Fox executives weren't the only ones pushing Rodgers and Hammerstein to adapt Landon's novel; there was a virtual army of people that included Landon's literary agent, Broadway legend Gertrude Lawrence, and both men's wives who were urging them to take on The King and I as their next project. The duo were reluctant at first, mostly because they did not fancy the idea of writing a star vehicle for Lawrence (the actress had a magical stage presence but limited vocal abilities, according to those who saw her perform). Finally, both men agreed to begin work on the musical after they were treated to a special viewing of the Harrison-Dunne film. Rodgers left the screening with the firm belief that the story had "the makings of a beautiful musical play." Rodgers and Hammerstein quickly got to work, but writing and producing The King and I proved to be an arduous task. First there was the problem of casting the right actor to play the mercurial king. The duo were considering Harrison, Alfred Drake, and Noel Coward, but they dropped all of those ideas when, at the urging of South Pacific star Mary Martin, they auditioned Brynner, a Russian-born actor who was making ends meet at the time by working as a TV director. Brynner's unique looks and forceful demeanor bowled over both men -- Rodgers was particularly impressed with Brynner's scowling skills-- and they immediately cast him as the king of Siam. 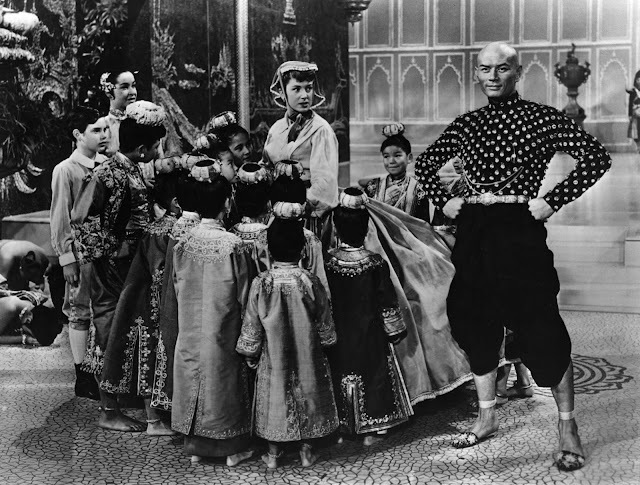 A production still from The King and I (1956) with Terry Saunders (far left); Rex Thompon (to Saunders' left); Patrick Adiarte (next to Thompson); Deborah Kerr, and Yul Brynner. Despite having the perfect lead actor, The King and I was a disaster during its preview run in New Haven, Conn. The critics felt it was too downbeat and brooding, and powerful Hollywood agent Leland Hayward even suggested closing the show. However, after extensive revisions, The King and I made a triumphant Broadway debut on March 29, 1951, eventually winning five Tony Awards including best musical, best actress for Lawrence, and best featured actor for Brynner. With those accolades and the boffo box-office numbers, it was inevitable that The King and I would become a movie after its Broadway run. Lawrence dreamed of playing Mrs. Anna on the big screen, but sadly she collapsed on stage and passed away on Sept. 6, 1952, from undiagnosed liver cancer (Lawrence was buried in the ballgown she wore for the "Shall We Dance?" number). Deborah Kerr, whose singing voice was dubbed by Marni Nixon, took over the role of Anna, while Brynner reprised his now iconic performance as the king. The film was another blockbuster, receiving five Academy Awards including a surprise best actor Oscar for Brynner, who would forever be associated with the role (in a bizarre twist of fate Brynner died from cancer in 1985 while appearing in a Broadway revival of The King and I). 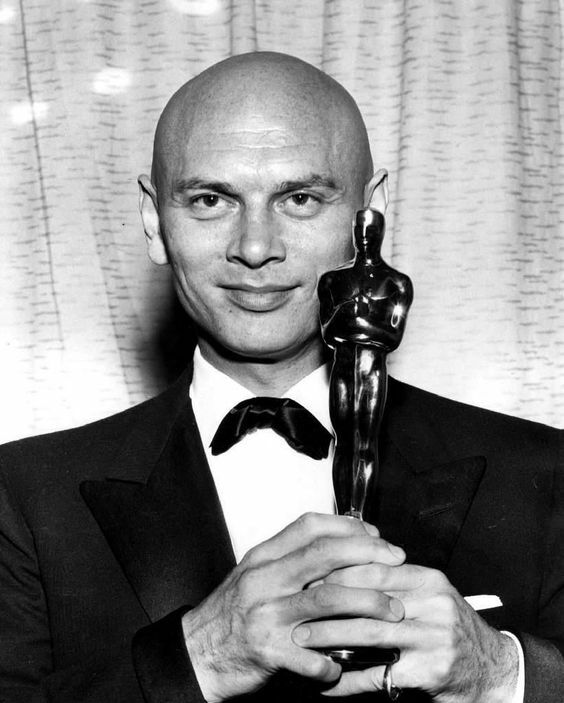 Yul Brynner with his Academy Award for The King and I (1956). Viewed today, The King and I is, along with The Sound of Music (1965), the best translation of Rodgers and Hammerstein's work from stage to screen. The King and I's sumptuous sets and lavish costumes look absolutely gorgeous onscreen, especially in choreographer Jerome Robbins' exquisite The Small House of Uncle Thomas ballet. More importantly the musical has an extremely compelling and surprisingly modern story that is beautifully acted by both Brynner and Kerr. There's no doubt that Anna is a proper Victorian lady, but she's also something of a feminist who chafes at the restrictions placed on women in Siamese society, and who openly scoffs at the king's chauvinist hot takes on gender and romance. The King and I is also a plea for tolerance, or, as Hammerstein put it in one of the show's best-known songs, "getting to know you." Despite their quarrels, Anna and the king have a relationship, albeit a sometimes uneasy one, because they are able to honestly communicate their thoughts and feelings to one another. However, the subplot of the Burmese concubine Tuptim ends in tragedy because no one at the Siamese court besides Anna even attempts to understand her deep sense of loss and abandonment after being taken from her homeland to be part of the king's harem. This sprightly show opener performed by Kerr/Nixon and Thompson is not only an endlessly hummable earworm, but it also establishes the Anna character as a feisty woman who can stand her ground in a male-dominated society. Anna sings this lovely ballad as a way of explaining her romance with her husband to Tuptim and the king's concubines. Rodgers carefully composed this tune to fit into Lawrence's limited vocal range, but the song is both intimate and soaring nonetheless. Hammerstein often referred to this as the duo's masterpiece; I tend to agree with him. The king's big show-stopper is a brilliant set piece that delineates the internal conflict of the character, i.e. his dream of becoming a "scientific" enlightened ruler like Abraham Lincoln, which clashes with his desire to maintain his despotic power when it suits his needs. During the show's original run, Brynner often skipped this number when he wanted a raise, a vacation, better billing, but he performs the heck out of it in the screen version; in fact, Brynner is so compelling that this scene is probably why he won the Oscar. One of the best-known songs in the Rodgers and Hammerstein canon, this lovely waltz was a last-minute addition during previews. Despite having dozens of cute kids on hand to play the king's many children, both men were reluctant to add a song for Anna to sing in the classroom, although virtually everyone associated with the show, and some who weren't, were literally begging them to do just that. Finally, they reworked an unused tune from South Pacific and created a magical musical moment. This achingly beautiful love ballad performed by Lun Tha (Carlos Rivas) and Tuptim is probably the most underrated song from The King and I (the actors were dubbed by Reuben Fuentes and Leona Gordon). It works especially well on the big screen with the spectacular garden set in the background; I get goosebumps every time I watch it (unfortunately, I couldn't find a clip). This showcase for the Lady Thiang character was another preview addition. The song both explains and humanizes the behavior of the king to Anna and, by extension, the audience. Brynner and Kerr glide through the lavish set to this rollicking waltz in one of the great moments in old Hollywood musicals. The King and I is available on Blu-ray and DVD. - Rodgers & Hammerstein by Ethan Mordden (I highly recommend this book for R&H fans; the photos alone are worth it, but Mordden is also THE musical theater historian). I believe I have forgotten what a magnificent movie and musical this is with its thoughtful characters and magnificent songs. I appreciate being reminded of this unassailable fact. I hadn't known about Lawrence being buried in her costume. I find that very touching. PS: Been doing some spring cleaning, I see. Very nice. First, I love the new look of your website. Second, this is an excellent choice for the blogathon. I had the opportunity to see the film on the big screen several months ago, and it is incredible. Those costumes! Those sets! The King and I should really be seen on the biggest screen you can find. Thanks for the kinds words about the website design! This review is awesome! I liked that you had clips of a lot of the songs--someone who hasn't seen the film can really get drawn in this way. Thanks again for joining the blogathon!